Michel Ney, Duke of Elchingen, prince of the Moskowa, marshal of France, was born at Saarlouis on the 10th of January 1769. His father was a cooper, and he received only a rudimentary education. 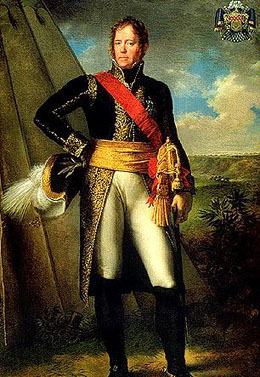 In 1788 he went to Metz and enlisted in a regiment of hussars; in 1792 he was elected lieutenant; and in 1794 he became captain and was placed by Kléber at the head of a special corps of light troops. He was soon promoted chef de brigade, and in 1796, after repeatedly distinguishing himself in action, general of brigade. He then commanded the right wing of Hoche's army up to the peace of Campo Formio. On the resumption of hostilities he again took the field, and for his surprise of Mannheim in 1799 received the grade of general of division. He distinguished himself and received three wounds in the Swiss campaign of André Masséna, and when Masséna turned against the Russians, who were approaching from Italy, Ney was left in command of the holding detachment opposite the Austrians. He displayed great vigor and skill in this work, and was completely successful, although his opponent was the famous Archduke Charles. In 1800 he was present at Hohenlinden. In May 1802 he married Mademoiselle Auguié, whom Josephine had chosen for him at Bonaparte's request. This event marks a change in Ney's political opinions which can only be explained by Napoleon's power of captivating men. He was from that point as ardent and sincere an admirer of Napoleon as he had been of revolutionary principles, and was one of the very few officers of the Army of the Rhine who became a trusted lieutenant of the emperor. He soon afterwards carried out an important diplomatic mission in Switzerland, and in 1803 he was placed in command of the camp of Montreuil. It was while there that, in the name of the army, he begged Napoleon to declare himself emperor, and on the establishment of the empire he was made marshal of France, and received the grand eagle of the Legion of Honor. In 1805 he commanded the VI corps of the Grand Army, and his great victory at Elchingen (for which in 1808 he was made duke of Elchingen) practically secured the surrender of the Austrians at Ulm. He was then ordered to the upper Adige, and missed the battle of Austerlitz, but was present at Jena and Eylau and led the decisive attack at Friedland. His reputation for personal heroism was by now at its height, and after Friedland Napoleon gave him the title by which he is still known, "the bravest of the brave." In 1808, after the first disaster to the French arms in Spain, Ney accompanied Napoleon there as commander of the VI corps. He took part in the Peninsular War from 1808 to 1811, commanding his corps in Napoleon's own operations of 1808-09, in the irregular operations in Galicia 1809-10, and under Masséna in the invasion of Portugal in 1810-11. In the last, however, he quarrelled bitterly with his former chief, and although he distinguished himself very greatly in command of the rearguard during the retreat from Torres Vedras -- notably at Redinha -- he was recalled to France by Napoleon and censured for his indiscipline. Almost immediately, however, he was re-employed with the Grande Armée in central Europe under Napoleon himself. In the 1812 expedition to Russia Ney commanded the center at Borodino, and was created prince of the Moskowa on the evening of the victory. In the retreat he was a tower of strength, animating the rearguard with his own sublime courage, keeping the harassed and famished soldiers together under the colors and personally standing in the ranks with musket and bayonet. He himself was the last to recross the frontier, and threw the remaining muskets into the Niemen. In 1813 he commanded a corps in the German campaign, fought at Lützen, Bautzen, Dennewitz and Leipzig, and in 1814 he shared in the victories and defeats of the campaign in France. At the fall of the Empire Ney was neither the first nor the last of the marshals to give up the struggle, but that he acted in the negotiations in concert with Macdonald and Caulaincourt is sufficient proof of his desire to avert the unreserved abdication that was forced upon Napoleon by other circumstances. Less satisfactory than his conduct at this crisis was his loud protestation of devotion to the Bourbons, when the Restoration was a fait accompli. But he was soon mortified by the disdain of the returned émigrés, and retired to his country seat. While on his way there to take up a command at Besançon, he learned of the return of Napoleon. He hurried at once to pay his respects to Louis XVIII and to assure him of his fidelity. With the famous remark that the usurper ought to be brought to Paris in an iron cage, he proceeded to Lons-le-Saulnier to bar Napoleon's progress. But instead of doing so, he deserted with his troops, and Napoleon's march became a triumphal progress. Ney's act was undeniably treason to his sovereign, but it was hardly the calculated treason that his émigré detractors saw fit to imagine. The first violence of his language, his ineffective efforts to make constitutional guarantees the price of his adhesion to Napoleon, and his final surrender to the dominant personality of his old leader, all show him to have been out of his depth in this political crisis. Napoleon received him kindly, but did not give him a command at first. But when the Waterloo campaign was about to begin he summoned Ney to the northern frontier. The marshal gladly obeyed and took up the command of the left wing on June 13. The next day the army moved into Belgium. Ney took part in the campaign successively in the roles of strategist, tactician and soldier. Much controversy has raged over his actions of the 15th and 16th of June. At Waterloo he was of course subordinated to the personal command of Napoleon, but his advice as to the conduct of the battle was often offered and sometimes accepted, and he personally led several charges of the French up to the British squares. But when all was lost, his courage, instead of burning brightly as in the Moscow retreat, was extinguished. He made no attempt to second Davout and Grouchy in the last days of Napoleon's reign, and in despair advocated the restoration of the Bourbons. Finding that Louis XVIII and his allies ignored his advances, he resolved to escape from France, but afterwards, believing himself protected by the terms of the convention concluded on the 3rd of June, he gave up the idea. Soon a fresh order was issued denouncing him by name, and after a half-hearted attempt to conceal himself he was arrested on the 5th of August. King Louis and his minister Decazes realized to the full the lasting unpopularity that would fall on the monarchy in consequence; they had done their best to facilitate the escape of the "traitors"; and when Louis heard of Ney's arrest he exclaimed, "By letting himself be caught he has done us more harm than he did on the 13th of March!" But neither king nor ministers were in a position to resist the clamor of the ultra-royalists for blood. Every fresh delay in the process of Ney's trial raised a new outcry at the court, in the salons and in the Chamber of Deputies; and fiercest of all in demanding immediate execution was the king's niece, the unhappy duchess of Angoulême, who lived to confess that had she known the record of Ney's services to France she would never have consented to his death. The king was powerless against this all but unanimous voice of royalist opinion, backed as it was by that of the powers to whom he owed his crown. Ney was placed on trial before a court-martial composed chiefly of his former brothers-in-arms, whose participation in the tragedy, slight as it was, was probably never forgiven them by their countrymen. Others of the marshal's old comrades refused to serve, and were disgraced in consequence, until public opinion forced their reinstatement. The court, once assembled, was only too glad to take advantage of the plea of Ney's counsel that he was entitled to be tried by his equals in the Chamber of Peers. In spite of the courageous and eloquent appeal of the young duc de Broglie, the result of the trial before the latter body was a foregone conclusion; as to Ney's treason there could be no doubt, and de Broglie was alone in voting for his acquittal. In the early morning of the 7th of December 1815 Ney was shot in the Luxembourg gardens, near the Observatory. He met his death quietly and with a perfect soldierly dignity that effaced the memory of his political extravagances, and made him, next to Napoleon himself, the most heroic figure of the time. Much has been said as to the share of the duke of Wellington in the trial and execution, and, rightly or wrongly, he has been blamed for allowing the Bourbons, when restored by the foreign bayonets that he controlled, to proscribe the soldiers who as soldiers had been included in the military capitulation to the Allies. Ney left materials for memoirs, but in an incomplete state. The Mémoires du maréchal Ney, published in 1833, were collected from these papers by his brother-in-law Gamot and by General Foy. They cover only the earlier part of his career, and end with the battle of Elchingen (October 1805). An edition in English was published the same year.